Many new therapists who are about to begin working with children with autism might be concerned about how to make themselves reinforcing. The main key to a proper ABA home program is for the therapist to pair themselves with highly enjoyable activities in order for teaching to occur. When a child knows that when you come over, good things happen, the ability to teach this child and reinforce this child becomes strong. How does this begin? Sing Songs The Child Likes – sing a variety of songs during play and if you get eye contact, start pausing to see if you can get some communication to sing more. Help The Child During Play – if the child likes putting shapes in a shape sorter, gather all the shapes and let the child request each piece either non verbally or verbally. This shows the child that they need you to complete a fun activity. For Older Children, Play Social Reinforcing Games – This includes pretending to sleep and having the child wake you up, or playing chase while you run around like an alligator ready to chomp. Games you can make “your own” will be powerful reinforcers for the child. 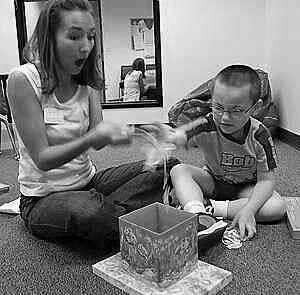 Add Funny Noises During Play – Make cool sound effects when playing cars or be dramatic with play. Many children enjoy crazy fun play with toys such as stuffing your shirt with toys and sneezing them out or wrapping playdough on animals and pretending they got hurt and need a cast. Have A Bag Of Goodies – This is highly important when you become an ABA therapist. This bag of toys will come home with you and are your own personal reinforcing toys. Go to your local dollar store and pick up a variety of toys such as slime, squishy balls, bouncy balls, slinkies, vibrating toys, light up toys, toy cars, bubbles and stretchy toys. Continually add toys as you get to know your children. Some children may like Bob the Builder so finding a Bob The Builder book can be highly reinforcing. Bubble Fun – Many children don’t know how to blow bubbles but enjoy bubbles. This is a fun activity to encourage communication and to pair yourself with. Gross Motor Fun – Many children love jumps, spins, lifts and anything to do with gross motor. Blanket rides, magic carpet rides, tub rides are all great fun activities that a therapist can pair themselves with. Special Books – There are many touch-feel books that children love. If children love regular books then you can use them to pair yourself with reading their favorite books. One of the children I am working with doesn’t seem to be interested in anything. I might get a small smile then he just looks around the room. Even the things he was supposed to be fixated on like the clothes dryer and the ball aren’t working for me. He likes the pool but then once he is in, how do I make him do anything else? Welcome to ABATherapists.com - a site dedicated to information on autism and autism therapy. When I started becoming interested in ABA therapy approximately 8 years ago, it was really difficult to find good and current information on autism. After years of learning the principles of ABA, I now find it necessary to provide information to other individuals on autism treatments. As well, I hope this site will be useful to new therapists interested in learning the basics of ABA therapy as well as gather some information on reinforcing stimuli. On this site you can find some of my research about information on autism. I'm primarily interested in ABA therapy, but of course I'm always open to any new findings/suggestions about autism treatments. I am always in the process of gathering and publishing more quality information on autism for parents and therapists. I hope you find my aba therapy articles informative and useful. You can set up your own blog on this site and contribute by providing information on autism and autism therapy. Or you join and post a topic. If you have any questions or comments, just join our community and dig in.